Lipomas are benign tumors composed of adipose tissue. They are almost encountered in the shoulder, back and neck regions. Clinically, they are usually presented as asymptomatic due to their slow growth. Recurrence is very rare after surgical resection. Giant lipoma in the cervical region israre and thus requiring surgical excision is for esthetic reasons, pain and limitation of neck mobility or problems in daily living. Some of these giant lipomas may become malignant and deteriorate quality of life. 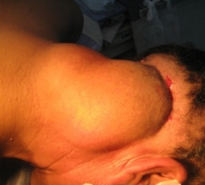 In the present study, we report a case of giant lipoma of the neck which was treated surgically with excellent outcome. Lipomas are the most common benign tumors of mesenchymal origin. They may arise in any location where adipose tissue is normally present but, their occurrence in the head and neck 1 region is relatively rare (13%). Lipomas occur more frequently in adults aged between 50 and 60 years old, but are uncommon in children. So, 5% of lipomas are multiple and more common in young men. Lipomas are slow growing tumors; they are mostly of small size and remain asymptomatic for many years; only a few of them grow to reach an exceptionally large size. A giant lipoma was defined by Sanchez et al 2 as a lesion that measures at least 10 cm in one dimension or weighs a minimum of 1000 g. We report a large lipoma occupying thecervico occipital region in a50 years old male patient. Our patient had no history as trauma, systemic disease or predisposing factors as obesity. A physical examination revealed a mobile and soft mass in consistency. The surface of the mass was lobulated, and margins were well defined.The skin overlying the lesion was normal. The clinical examination revealed no neurological deficits. Craniocervical computed tomography revealed subcutaneous neck mass.It is oval in shape, multilobulated, well limited, surrounded by a thin capsule. The masshada fat density and measured120mm X74mm. The neibourhing muscles and bone were of normal appearance. Patient was operated under general anesthesia in the prone position and the subcutaneous mass was removed totally in “block resection”after a careful dissection of the subcutaneous tissues surrounding the capsule. Hemostasis was performed and drain was placed for two days in order to prevent the accumulation of blood in the operative bed. The patient was discharged on the fourth day and the sutures were removed on the tenth day. Histological examination confirmed the diagnosis of benign lipoma. There was no recurrence in the follow-up period over one year. Lipoma is a benign tumor of mesenchymal origin 3 . It constitutes 5% of all benign tumours of the body and can be found anywhere in the body 4 . Only 13% of Lipoma are located in the head and neck region of which posterior neck is the commonest site 3 5 . Hairyskin 7 . Solitary lipomas are seen in 80% of cases, especially in women, while multiple lipomas are seen in men 8 . 10 cm in diameter, although some authors believe it should be more than 5 cm 8 . Giant lipomas are defined by Sanchez et al as lesions with a size of at least 10 cm in one dimension or weighing a minimum of 1000 g 4 . Also inliterature, giant lipoma localizations were reported as back andposterior cervical area 9 . The largest lipoma in the literature was reported in 1894; it weighed 22,7kg and was located on the left scapula of young man 9 . The exact aetiology of Lipoma is still unknown. Sub cutaneous lipoma is associated with trauma, obesity or hypercholesterolemia 9 . The traumatic factor causing the lipomasis explained by therupture of the ﬁbrous septae, which induces adipose tissue migration and proliferation 10 9 11 . In our present case, we didn’t detect any one of these parameters. In the present case, the benign nature of the lipoma was confirmed by computed tomography which showed a well limited sub cutaneous mass with a fat density, surrounded by a thin capsule and withno infiltrationof sub cutaneous tissues, muscles or bone. Giant lipomas are primarily a cosmetic problem 8 9 they may also cause functional limitation 8 because of their large size and weight, or signs of compression may be present; however, this is unusual 9 Our patient required a surgical treatment because of his physical appearance and many problems encountered in his daily living as inability to lie in the supine position, difficulty with dressing and sitting in comfortable position. Surgical excision is the treatment of choice and since they have a well-defined pseudo capsule, dissection around these benign lesion is performed easily 7 . 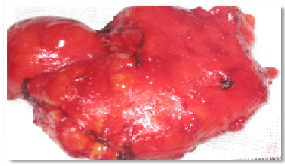 Resection may be difficult due to large size and adherence to surrounding tissues. In the case of suspicious lipoma, fine needle aspiration biopsy can be performed prior to surgery. Intraoperatively, our lesion was soft, yellow and lobulated. It was mobile with smooth surface and without infiltrating of sub cutaneous tissues, muscles or bone. Histopathological examination must be performed carefully in order to perform a good diagnosis. It allows the assessment of mitotic activity, cellular atypia, necrosis and invasion of contiguous tissues 11 15 . Immunohistochimical evaluation is helpful for the diagnosis of liposarcoma. Vimentin and S-100 protein are positive both in lipoma and liposarcoma but the FISH is positive in liposarcoma . So, it consti tuate an fundamental tool for the diagnosis of liposarcoma 10 . Recurrence is possible in malignant forms and in case of incomplete excision. Predisposing factors and aetiopathogenetic mechanisms underlying the development of lipomas are still unknown. The diagnosis is frequently based on clinical manifestations. However, a small subcutaneous mass, mobile on underlying spaces and not painfulsuggests a benign lipoma. This cannot be asserted for a big mass as the one encountered in the present case.In summary, considering the size of the mass, its unusual site and the differential diagnosis with liposarcoma, we considered that the surgical policy is mandatory.